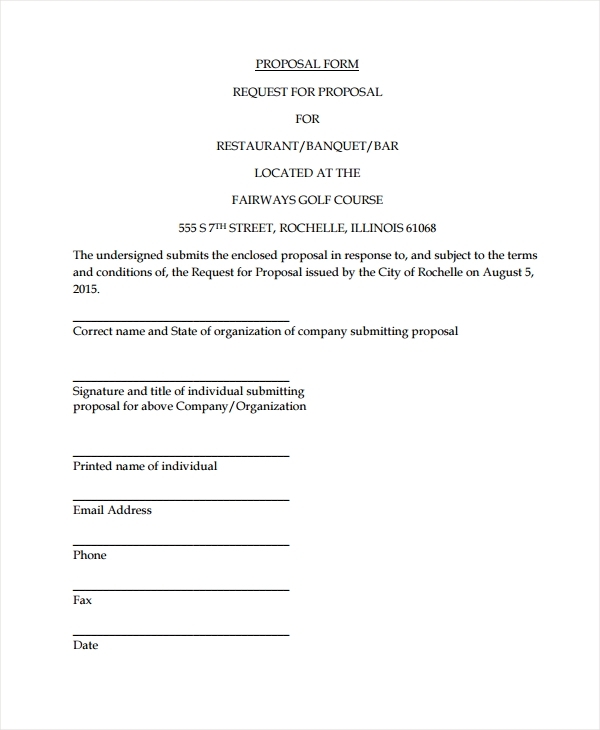 Restaurant proposal forms are documents that will state the detailed ideas and business plans of an individual aiming to open his own restaurant business. 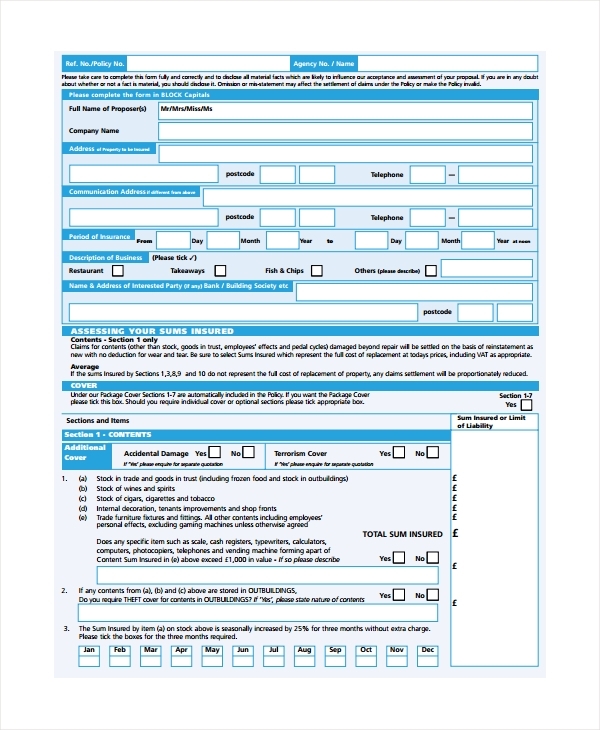 The form will be presented to investors, sponsors, insurance and service providers. It is essential that the restaurant’s design, as well as the plans of how the restaurant will be managed, are stated in the form to aid in the decision-making of the investors of whether they will grant a chance or not for the business. 1. Type of proposal – This refers to the title of the document whether it is a request proposal or application. Additionally, the date when the proposal was completed should also be in this primary section along with the company and its location in the state. 2. Description of proposal and facilities – This serves as an introduction to what the proposal is all about and what type of restaurant will be opened. The facilities needed for operating the restaurant will also be listed in order to determine who the suppliers will be and the number of equipment to meet the function of the business. 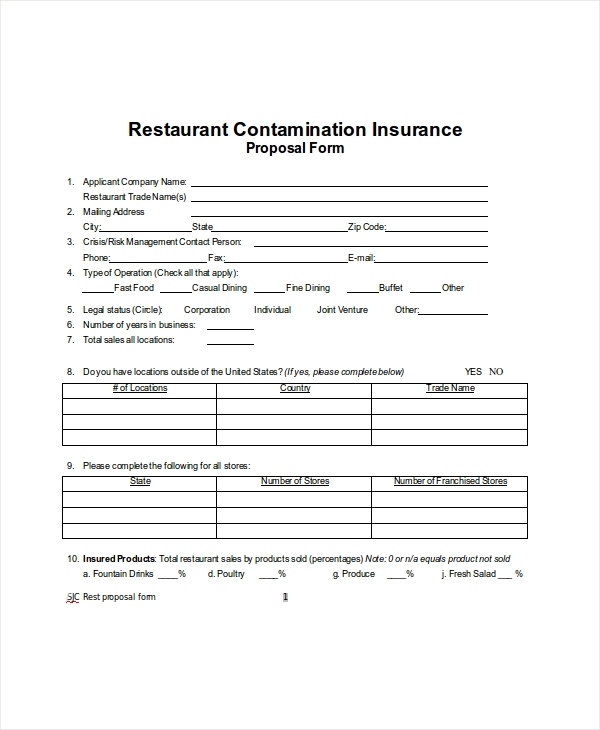 You can also like restaurant legal forms. 3. Establishment rental or purchase – The price of how much amount will be allotted for purchasing or renting the restaurant’s establishment will be distinguished in this section. Other details include the taxes, terms, and conditions of the lease agreement, as well as the period when the establishment will be ready for beginning the reconstruction of the restaurant’s plan should also be stated. 4. 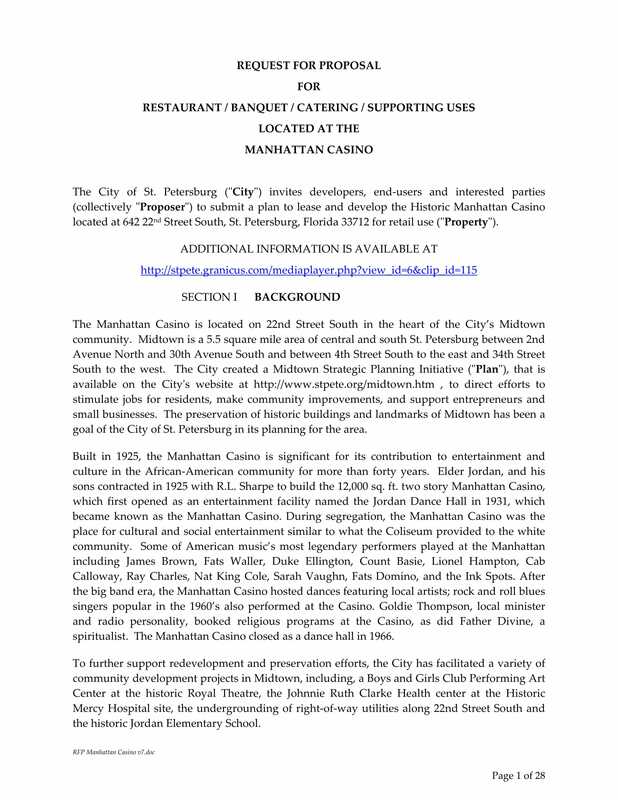 Proposed arrangements – This section contains the general information about the restaurant’s maintenance plans including the parking areas and other parts in the premises of the restaurant. The owner’s commitment statement with regards to securing that the restaurant is meeting the state’s standards and regulations are also required to be written in this section of the form to determine the range of responsibilities and obligations that the owner is willing to take. You can also like restaurant reservation forms. 5. Business timeline – This dates when the facilities and equipment will be installed in the restaurant establishment and when the business will be opened for catering the public’s demands are found in this section. Similar to other timelines, this section must indicate who are the assigned individuals managing the day’s tasks in order to determine who will be held responsible or liable in events of accidents. You can also like restaurant feedback forms. 6. Proposer’s information – The proposer is the person who presents the proposal form to the other involved parties. With this section, the proposer will need to state his experiences of handling businesses from the similar industry along with his financial information that contains a certified financial statement and credit report. At the end of this section is the contact information of the proposer to assure that all the parties will be able to reach him through available contact numbers, electronic mail addresses, and mailing address. Restaurant Liability Proposal Form – Restaurant management is not an easy duty for any restaurant owner. Dealing with drunkards, injured patrons are some of the incidents that restaurant owners tend to forget as they dream of success for their business. This is why securing a restaurant’s insurance is essential to be done by the owner. With this, a restaurant liability proposal form will be used which contains the period of insurance proposal, limit of indemnity, the identification of the people insured with the policy or coverage as well as the types of liabilities the restaurant will be protected from. An indication of whether the owner has signed a previous hold harmless agreement will also be stated in this form to assure that the agreement’s clauses will not conflict with the insurance provider’s terms. The insurance history of the owner along with his declarations and signature will then close the document as these details are at the last section of the liability proposal document. 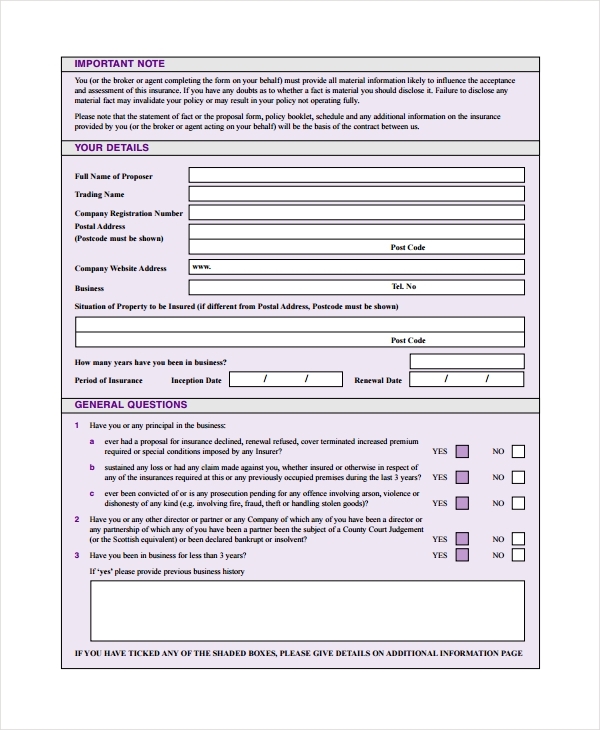 Restaurant Takeaway Proposal Form – This document has similar areas to the aforementioned restaurant liability form. However, there is a specific section in this form that is different from other proposal documents since it contains a general questionnaire before the terms and conditions are stated. The questionnaire is significant for determining who are the sole occupants of the establishment where the restaurant will be opened and other general information which relates to the safety and financial stability of the restaurant. When submitting this document, the owner must also complete the accompanying paper which is a method of payment and authorization form. This allows the insurance provider to acquire the funds and the payments in issuing an insurance policy for the restaurant business. A direct debit guarantee will be at the end of the form which will focus on detailing the rules of the scheme securing that notice forms are sent to the restaurant owner upon complying with the insurance provider’s fees. 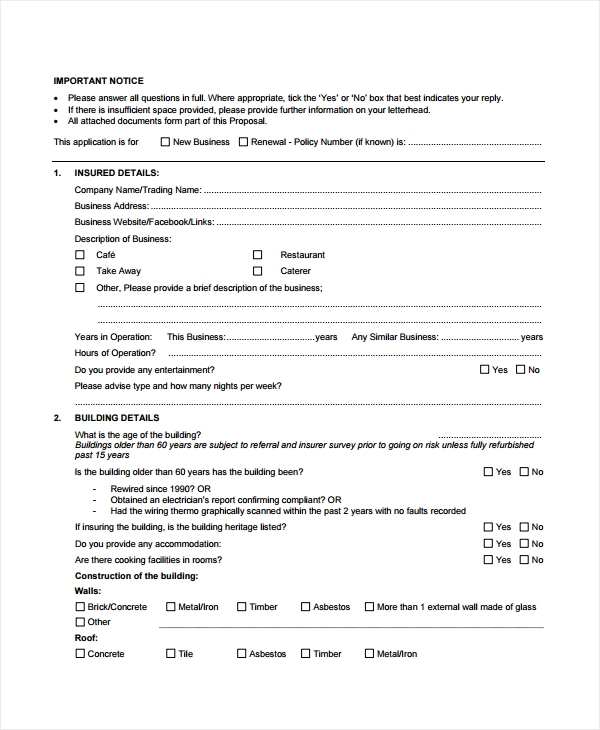 Restaurant Proposal Application Form – When completing for any sort of business or restaurant application form, the user must secure that all the details about the business and the establishment are supported by the appropriate documents. 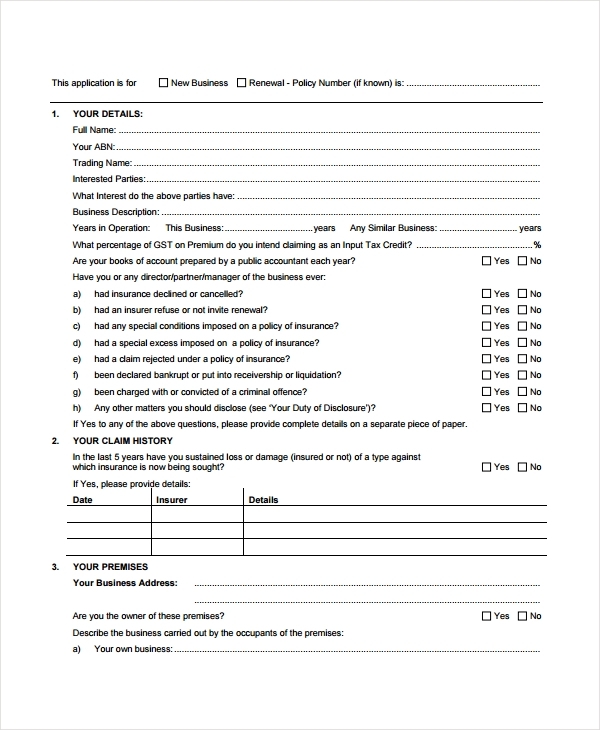 In this restaurant proposal application form, the user or the owner will be able to apply for funds, insurance policies, as well as the security of his business. Nonetheless, the form must be customized based on what subject is being applied for by the user in order to assure that the business needs are met and catered by the providers. 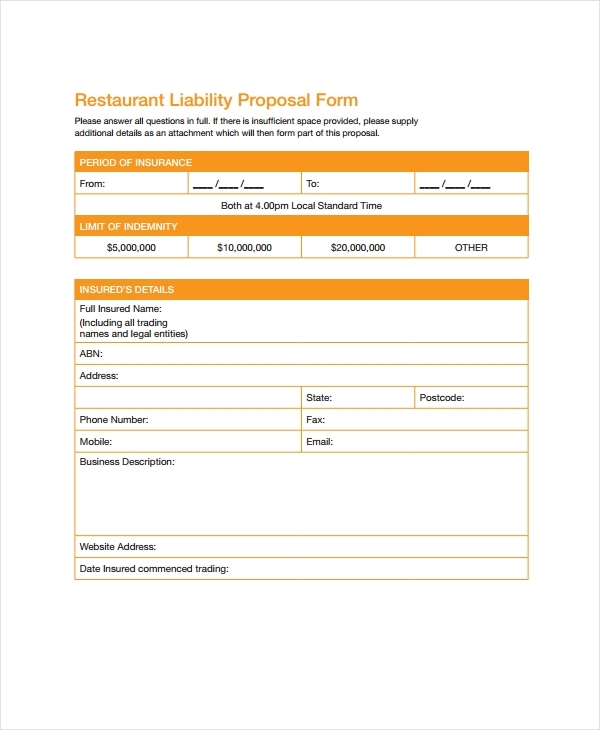 With these information about restaurant proposal forms, any individual will be able to pull off his restaurant dreams. However, he must assure to keep a duplicate of his legal forms and documents in order to assure that appropriate papers will be presented whenever needed.